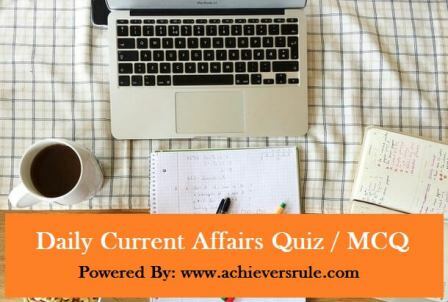 Practice the Daily Current Affairs MCQ/Quiz regularly and complete your preparation for the upcoming Govt. Exams. You must read the Current Affairs Update and Current Affairs Articles from Achiever's Rule as it can be important for the exams. You may download the available PDFs. Q1.Which of the following countries is not a part of Malabar Naval Excercise-2017 in Bay of Bengal ? Q2.Which of the following statements is/are part(s) of Ministry of Housing and Urban Affairs (MoHUA) ? Q3.In which city, B. R Ambedkar International Conference On Social Justice will held ? Q4.Which Formula One Driver has won the 2017 Austrian Grand Prix ? Q5.Who is elected as the President of Mongolia ? Q6.India and Bangladesh jointly have decided to construct a bridge on which river ? Q7.In which country, Apple will build its 2nd Data Center which will be entirely powered by renewable energy ? Q8.Who is elected as the President of National Rifle Association of India (NRAI) ? Q9.Which State Govt.has launched Free Surgery Scheme in private hospitals ? Q10.What is the rank of India in the final medal tally of Asian Athletics Championships 2017 ?